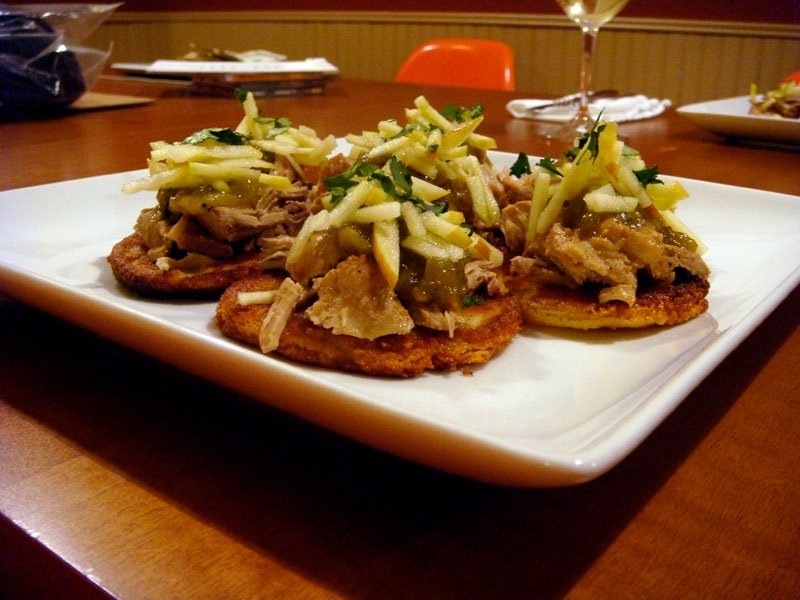 Pork With Green Chiles, Apples and Arepas — Top Chef All-Stars Night | Eat.Drink.Life.Love. If someone gave me free rein to run through Target, pick up items to construct a makeshift “kitchen” in the aisle, grab food and then told me I had a few hours to make a gourmet dinner I think I’d be able to do it. I also think I’d be able to avoid making soup. Then again, I’ve been into a Target store before. Several of the Top Chef contestants apparently had not. They seemed overwhelmed by the sheer volume of stuff in their fields of vision and many of them simply grabbed crockpots and ended up with soup. Richard Blais (our favorite to win) got creative made some tender pork to pile on corn pancakes called arepas. We were sold. We happened to make this recipe on Pancake Day, so it was clearly fate that we were making pork with green chilies, apples and corn pancakes (arepas). We decided it was fate despite the fact that the recipe is titled “Pork tenderloin with green chilies…” and pork tenderloin is nowhere in the ingredient list. Also, there are no instructions on how to make the corn pancakes. We used a recipe from Epicurious found here. Chad the Bravo intern just isn’t taking his job as seriously anymore. K couldn’t find acceptable pork ribs, so he went with three bone-in pork chops from Niman Ranch. At midday, I gave them a quick saute to brown them then threw some cumin, coriander, garlic powder, 0nion powder and cinnamon in the crock pot and covered everything with ham stock. When we got home, the pork was smelling good, but was pretty dry so K shredded it and let it soak in the hot cooking liquid. He then started on the green chili sauce by warming a can of green chilies and a few shakes of Tabasco. But the sauce was too thick, so he added a little water, but the sauce was also too spicy so he added a little lime juice and the remainder of the Frontera guacamole starter and let it simmer for awhile. Meanwhile, I was mixing milk, butter, masa flour, sugar, salt and grated mozzarella cheese into dough for the arepas. I rolled about a tablespoon of dough into a ball then flattened it with the palm of my hand. We heated up some oil and set to frying them — letting them drain on paper towels after each batch. K quickly juilenned an apple then started assembling our little pancakes of goodness. The arepas were delicious! In the future, any protein I’d like delivered into my mouth I want to arrive on these crispy corn vehicles. The protein we’d chosen, however, was still dry. In the future, I’d use pork shoulder which seems to be perfect for shredding. The green chili sauce was spicy, which K enjoyed, but it was a bit too much for me. I did enjoy the fresh, tart crispness of the apples though. Despite their petite size, these pulled pork pancakes were remarkably filling. Note: They do not reheat well the next day. So if you’re going to have your arepas, make them and eat them while they’re hot and fresh. No matter what you put on top of them, everything will taste better on tiny corn pancakes!